I would like to do more reading than what I get to do these days. So when I got the opportunity to review the new Kindle Paperwhite (yes, there is another Kindle Paperwhite in the market) I was looking forward to the opportunity to review the sixth generation of the ebook reader and second in the Paperwhite series. However, even a week after I got there devices, I was just carrying it everywhere in my backpack, not really getting to read anything long or even play around with the newer features. Finally, the opportunity presented itself in the form of a three-day official trip to Chennai. Due to the nature of the trip, I was sure there would not be much time to read once I was there. But nothing could stop me from reading at the airport and while flying. So that means at least eight hours of reading. 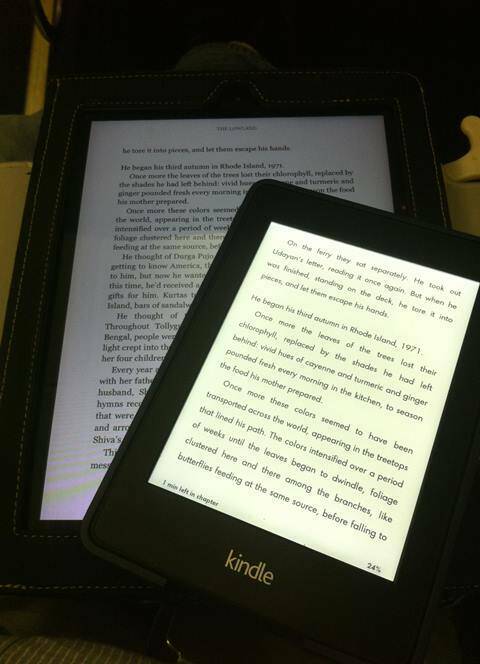 Here’s my experience with the Kindle Paperwhite, recorded over two new airports and two rather old aircraft in between. I am in the taxi en route to the airport. So I decide to take the Paperwhite out and download some stuff to read during the flight. This version has 3G, so I am not tethered to a Wi-Fi network for updates. I decide to first sync a few books that are already there in my Kindle account, either partially read or unread — I do use the Kindle app on my iPad to read books once in a while. I then buy Ramachandra Guha’s India After Gandhi, a book I have been dying to read. I also find the cover of theColumbia Journalism Review (Evgeny vs the Internet) interesting and decide to subscribe to the magazine. It helps that the first month is free, after which I can take a call on whether I want to continue with the subscription. The entire process has taken me under five minutes, the 3G is quite fast on this one. At the airport, I try and log in to the free Wi-Fi to see how the experience is. But I could experience a faster download, most probably because the airport Wi-Fi was being used by hundreds of passengers. It is not much of a difference in speeds and I am not really spending money as the 3G does not entail usage cost. Interestingly, the device automatically switches off the 3G when it is latched on to a wireless network. As I try to log in to Goodreads, it is time to board the flight. The Kindle Paperwhite — like its earlier version — is not much larger than a thin paperback and can easily go inside my coat pocket.